Choosing the right flooring for your home can be a tough job, but with so many options available, it doesn’t have to be a headache. Natural stone and ceramic tiles are two popular choices for kitchens and bathrooms. Their durability and natural beauty make them a definite upgrade from vinyl flooring, but making the right selection can be a little tricky. At first glance, the differences between ceramic and stone tile may not be obvious, but there are some important differences to consider before choosing which type of tile to purchase for your home. First of all, it’s important to consider how you will need to care for your tile. Caring for both ceramic and stone tile requires lots of mopping and cleaning with a special grout cleanser, but looking after ceramic tile is less work intensive. This is due to ceramic tiles uniform structure that makes cleaning easier and less time intensive. Natural stone, on the other hand, tends to have natural ridges and color discrepancies that can make it trickier to clean. Of course, this natural variation in color and texture is all part of the beauty and appeal of natural stone, but beauty does come with a price in this case! Unlike ceramic tile, each stone tile is unique and can’t be replicated. 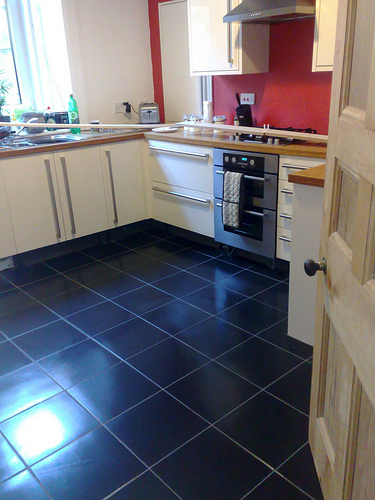 For areas of your home where you want your flooring to make an impact, natural stone is ideal. The natural variation in texture and color make it subtle but striking, and these properties mean it can add interest to an otherwise simple or sparsely decorated area. For areas where too much variation in color or texture may be too “busy,” ceramic tile is likely a better option. The uniformity of ceramic tile means you won’t have to worry about your flooring dominating with too much detail, drawing away from other elements in the room. When choosing between ceramic and stone flooring, it’s also important to consider the sealing process. Sealing is an important step in ensuring the longevity of tile flooring, and in the case of ceramic and stone tiling, ceramic is a much easier option. Ceramic tiles even texture allows the sealant to adhere to the tile uniformly, giving a longer and more reliable seal. This means that the seal on ceramic tile will last considerably longer than on natural stone. If durability is important to you, then natural stone may be your best option. Stone, especially granite, is highly resistant to scratches and will withstand heavy traffic. Ceramic stone, on the other hand, is constructed from synthetic materials and is less durable. After time, ceramic tile may show signs of wear and small cracks and chips are more likely to appear. With these points in mind, both ceramic and natural stone can be excellent investments, however; the right choice will depend on the individual needs of your household.